Miranda Loutet presented a poster at the 24th Canadian Conference on Global Health 2018 in Toronto, Ontario. The poster described the Global Health Sim methodology used to design and facilitate simulations, along with results from an evaluation of our simulations. Many enthusiastic colleagues stopped by to discuss the poster, establishing new connections across Canada and globally. The other posters located around ours were also about innovative education and training among various disciplines of global health – it was very inspiring to meet such motivated individuals working together to improve education in global health! Miranda Loutet and Thomas Piggott presented on evaluations completed during previous Global Health Sim sessions at the CPHA conference in Montreal in May 2018. The full video recording of the presentation is available here. 12 enthusiastic students from the University of Ottawa came together for a fascinating simulation of an emerging infectious disease outbreak, modelled off of the Zika epidemic in its early phases. Lots of lessons learned and expertise shared by the Facilitators including Janet Hatcher Roberts, Carol Vlasoff and Ron St Jon from the University of Ottawa and Thomas Piggott from Global Health Sim. 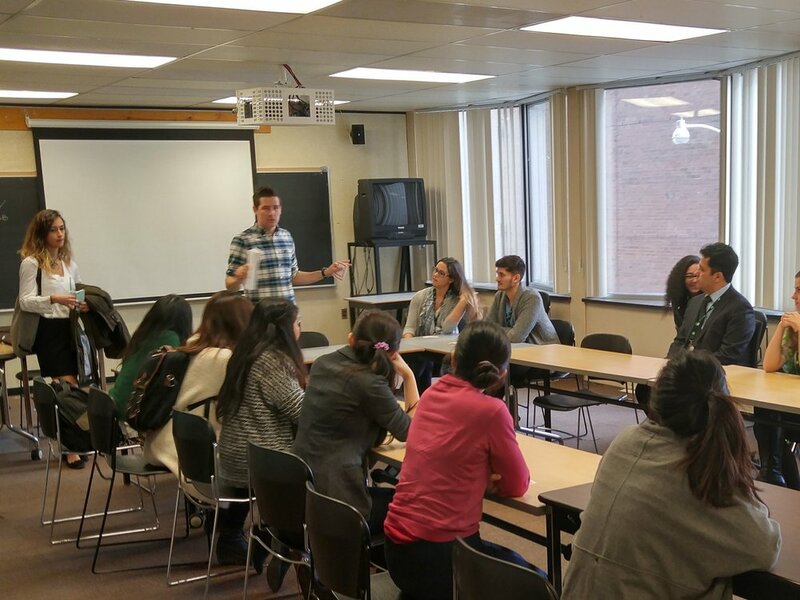 20 students and young professionals from all across Ontario attended a simulation as part of the annual Canadian Coalition for Global Health Research Student and Young Professionals Summit at McMaster University. Participants with all different backgrounds and varying levels of experience in the field were immensely engaged throughout the entire simulation, and solidified their learning through in depth discussions during the debrief. We hope to be apart of this annual summit to facilitate global health capacity building through professional development and networking opportunities such as participating in an engaging sim! I still vividly recall my first time participating in a Global Health Sim. I was at the annual Health and Human Rights Conference held by the University of Toronto International Health Program, where one of the breakout sessions was a "global health simulation." Intrigued, I decided to attend. Two dozen conference participants filed into a conference room and the session facilitators set the scene: we were all stakeholders responding to an emerging Zika outbreak in Brazil. For context, this conference was happening in March of 2016, right when cases of Zika in South and Central America were dominating headlines in international news. The proposed scenario was even more relevant for me because, at that time, I was an intern at Médecins Sans Frontières/Doctors Without Borders Canada, and one of my tasks had been creating briefing notes on Zika outbreaks. I was excited about the prospect of applying my new-found knowledge. The facilitators then handed each of us an envelope containing our role and personalized objectives for the simulation. I opened my envelope and pulled out my role sheet – international news correspondent. I was a TV journalist! Then, the clock started and the real fun began. Tables were pushed aside and conversations erupted as the 20 odd individuals in the room milled about trying to find out what other global health actors were in the room. As I was the reporter, I had the freedom to listen in on any conversation I could sneak myself into. I observed partnerships being formed between governmental departments and international agencies; caught disputes between controversial pseudoscience organizations and local university researchers; overheard the pleas of women's and children's rights activists; and more. The simulation culminated with a roundtable discussion led by the chair of an ad hoc UN committee created to respond to the public health crisis. At the roundtable, all stakeholders gathered and made their case for how the response to Zika outbreak should be carried out and funding priorities. To conclude the session, the facilitators played a spectacular news segment featuring brief clips of impromptu interviews and improvised news reports I had recorded throughout the session. Many parts of this experience stood out to me – the exciting energy in the room during the simulation, the way participants delved into their assigned roles, the negotiation challenges due to conflicting priorities that mirrored the reality of international forums, and the blend of instructive fact-based scenarios and entertaining role-playing set-up. From hearing others' comments during the debrief portion, I knew I wasn’t the only one impressed by the innovative educational approach. And that is how my first simulation experience inspired me to get involved with Global Health Sim. I knew I wanted to help bring experiential learning to more students, health sector professionals and public health enthusiasts. I am now the Communications Director and board member for Global Health Sim, and have had the opportunity to contribute to every step in the development and facilitation of simulations – from A to Z! Want to join me and countless others from around the world in this movement to reinvent global health education? You can now sign up for our online Simulation Facilitator Course at ghsim.com/course! Photo credit: Jessica Ruscello at https://unsplash.com/photos/OQSCtabGkSY. If you're teaching global health, these two new textbooks are a fantastic educational resources. If you have resources that you'd like us to share, please let us know! Preparing for International Health Experiences is a must-read for any healthcare student considering volunteering, doing mission or practical work abroad. It covers specific medical professions from pediatrics to surgery, and allied disciplines such as dentistry and nursing. This unique resource offers necessary insights into making the most of the experience, from pre-departure training through to return orientation. It provides information on navigating the legalities and bureaucracies of international medical training and gives insights into cultural and language competencies, including how to be ethical and deferential in the exchange of situational knowledge. Global Health Experiential Education: From Theory to Practice presents best practices for ethical and safe international health elective experiences for trainees and the educational competencies and evaluation techniques that make them valuable. It includes commentaries, discussions and descriptions of new global health education guidelines, reviews of the literature, as well as research. It includes ground-breaking research on perspectives of partners in the Global South whose voices are often unheard, student perspectives and critical discussions of the historical foundations and power dynamics inherent in international medical work. This book will be of interest to academic directors of global health programs and anyone involved in training and international exchanges across North America. If you want to gain experience in global health education, consider applying to the Global Health Sim facilitator course! A brilliant group of students and staff at the London School of Hygiene and Tropical Medicine participated in a simulation on refugee health crisis prioritisation and response run by Dr Rabia Bana. Thanks to everyone who came out and enthusiastically participated! If you’re interested in learning how to facilitate simulations consider applying for the Facilitator Course. At the Global Health Student and Young Professional Conference in Ottawa a few years ago, an idea to change Global Health Education was born. I had been asked to run a workshop or give a conference presentation on humanitarian response. Having attended many conferences before, I knew that these kinds of sessions can sometimes be very didactic and not engaging. That was the last thing I wanted to spring on conference attendees in the afternoon... after lunch... just as they were starting to get a little bit sleepy. So I started thinking about more engaging alternatives. I reflected on my education so far, and that the most enjoyable aspects standing out were the experiential hands-on activities: learning by doing. In medicine I had a lot of experience with practicing skills and procedures in safe spaces, through simulation, before doing them in the real world. Before medicine I had been involved in experiential learning through EBL or enquiry-based learning at the University of Guelph. I had the incredible opportunity to learn from Drs Jacqueline Murray and Alastair Summerlee, two seminal educators fostering EBL in First Year Seminar courses. These courses went through cases, real world problems, and had us take on the role of actually solving them! That course was head and shoulders above my others. Why can’t we do something similar to simulation training in medicine and EBL in education to teach public and global health in a more engaging way I thought? Trying to find something like this was challenging, examples of it were nowhere to be seen online. But I didn’t let that stop me! I ended up writing the script for a simulation myself. Painstakingly, I researched the nuances of a global health crisis, in that case an earthquake complex emergency, and I wrote a context and the roles for each of the participants attending. Then I set it into action. I brought along my camera to actually film the ‘journalist’, gave real data to the ‘epidemiologist’, gave a real human rights report to the human rights watchdog and encouraged the president to act ‘presidential’. The session was underway. That first Sim was very well attended, and each participant had a role to undertake - everyone did a great job acting their part! Seeing it all come together was magical. One attendee who had been involved in humanitarian response had said “this feels so similar to what it’s actually like to be out there!”. From the success of this first sim, the movement has grown. We’ve built a team and ran sims for conferences, classes and organizations in three continents and participants all over the world online with E-Sims. Our team is committed to creating resources and training facilitators (see ghsim.com/course to apply!) to make global health education experiential and engaging, through simulation. If you’re interested in learning more about simulation in global health, consider applying for our upcoming facilitator course! 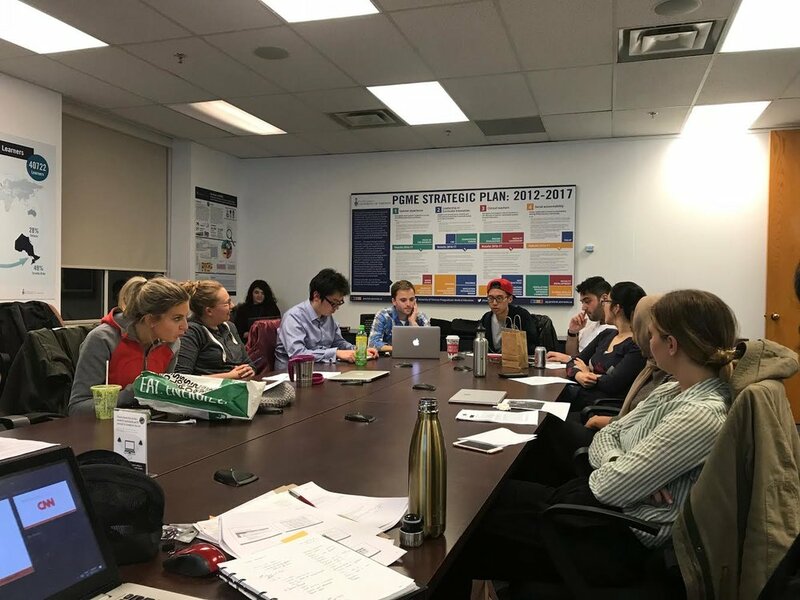 An enthusiastic group of resident doctors enrolled in the Global Health Education Initiative participated in a simulation on refugee health and humanitarian response at the University of Toronto in Canada. Participants gained hands on experience regarding the health concerns in the context of a humanitarian crisis and put skills they have been learning in the course into practice! Dr Jennifer Hulme, emergency medicine doctor in Toronto and Global Health researcher and educator facilitated an engaging simulation today for 30 attendees at the Global Health Student and Young Professionals (GH-SYP) Conference in Ottawa. Attendees took on roles as stakeholders in the response to a humanitarian refugee crisis learning about public health prioritisation in an emergency. Click here to find out more about Global Health Sim and here to find out about the Global Health Sim Facilitator Course to train you to facilitation Global Health Sims. In March, Julie Zhang led a refugee health response simulation for a graduate global health class at the University of Guelph. The students came from a variety of disciplines, from international development to computer science, and applied their in-course knowledge and unique backgrounds to the sim scenario. During the debrief period, the participants had an engaging discussion on the untapped value of experiential learning in higher education. Thank you to Professors Sherilee Harper and Warren Dodd for the invitation to facilitate in their classroom! Chair of Global Health Sim, Thomas Piggott, is in Geneva to talk to attendees of the World Health Assembly [#WHA70] about simulations in global health education. Global Health Sim recently launched its facilitators course to build capacity in simulation-based learning for global health education. The pilot course will have 30 students from all over the world who will collaborate online to learn about the theoretical basis of simulation education, develop simulations and learn to facilitate them effectively. If you're interested in innovative global health education check out the facilitators course and we hope to speak with you during the World Health Assembly! A great group of students from @LSHTMpress participated in Simulation #3: Fine Line, Between Body and Mind. Good critical dialogue in the debrief on the challenges of advancing mental health needs in the context of competing priorities. 60 students from Melbourne and all over the world came out to two simulations run simultaneously with the incredible help of Stefan, Ali and Cassandra. Thanks to those who came out for an engaging afternoon of simulations. An enthusiastic group of LSHTM students from all over the world gathered to respond to a refugee crisis in a fictitious country. There was great discussion in the debrief, notably on the distinction between impartiality and neutrality, and priority setting in complex emergencies. Thanks for coming out! An enthusiastic group of LSHTM students came together to participate in a Simulation facilitated by Thomas Piggott and Miranda Loutet in London, UK! Over 80 people attended two fantastic sims today at the University of Ottawa for the Global Health Conference. Olivia Varsaneux and Thomas Piggott ran a simulation in partnership with the i-Sense group in London, UK with an energetic group of researchers. Three companies raced to produce the best diagnostic test in response to an emerging infectious disease outbreak! The GH Sim group led a simulation at PEGASUS Conference in Toronto. 20 participants from different stages of their careers came together in an engaging and animated session!